Swim, bike and run to the finish line. 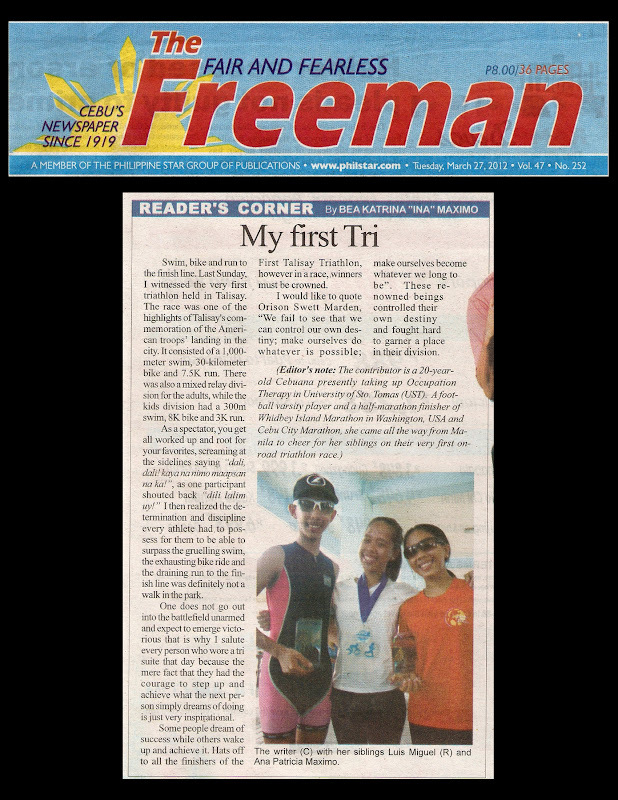 Last Sunday, I witnessed the very first triathlon held in Talisay. The race was one of the highlights of Talisay's commemoration of the American troops’ landing in the city. It consisted of a 1,000-meter swim, 30-kilometer bike and 7.5K run. There was also a mixed relay division for the adults, while the kids division had a 300m swim, 8K bike and 3K run. As a spectator, you get all worked up and root for your favorites, screaming at the sidelines saying “dali, dali! kaya na nimo maapsan na ka!”, as one participant shouted back “dili lalim uy!” I then realized the determination and discipline every athlete had to possess for them to be able to surpass the gruelling swim, the exhausting bike ride and the draining run to the finish line was definitely not a walk in the park. One does not go out into the battlefield unarmed and expect to emerge victorious that is why I salute every person who wore a tri suite that day because the mere fact that they had the courage to step up and achieve what the next person simply dreams of doing is just very inspirational. Some people dream of success while others wake up and achieve it. Hats off to all the finishers of the First Talisay Triathlon, however in a race, winners must be crowned. I would like to quote Orison Swett Marden, “We fail to see that we can control our own destiny; make ourselves do whatever is possible; make ourselves become whatever we long to be”. These renowned beings controlled their own destiny and fought hard to garner a place in their division.